Plutarch’s next subject in his Lives is one of the most colourful of his Greek statesmen: Pericles. He starts his account with a lengthy peroration to justify starting this book. You don’t have to get far into it to realise that no justification was needed. One of his first revelations about Pericles confirms the impression that I have formed from several images made of him: his head was long and appeared out of proportion. Accordingly he is often shown wearing headgear, to try to disguise this characteristic. Pietro Perugino (1450–1523), Pericles (1497-1500), pen and ink on white paper, 26 x 16.4 cm, Galleria degli Uffizi, Florence, Italy. Wikimedia Commons. Pietro Perugino’s pen and ink portrait of Pericles from 1497-1500 gives him a very long beard, and a hat, but his head still looks disproportionately long. Pericles was of noble birth, and was well-schooled, but shy when he was young. Initially, he avoided politics and pursued a military career, in which Plutarch considers him to have been ‘brave and enterprising’. But when other statesmen, like Aristides, Themistocles, and Cimon, were no longer active (dead, banished, overseas on a military expedition), Pericles devoted himself to the cause of the many poor people of Athens. 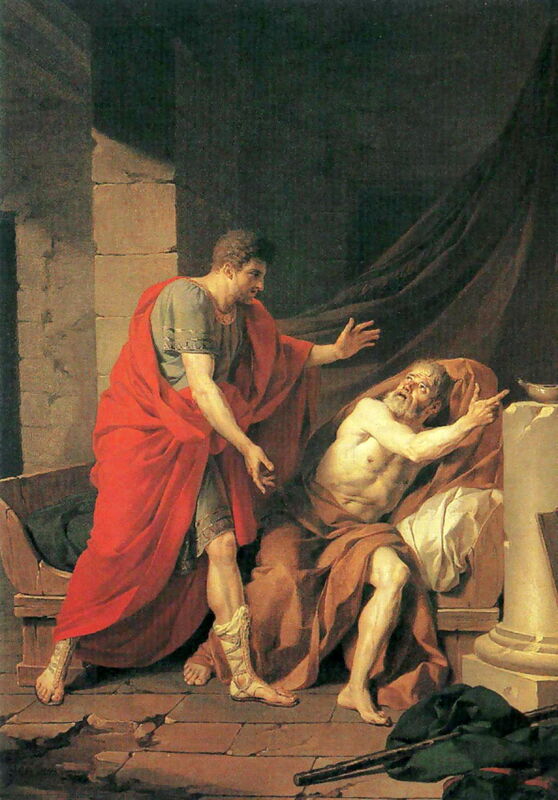 Nicolas Guibal (1725–1784), Socrates teaching Pericles (1780), oil on canvas, dimensions not known, Landesmuseum Württemberg, Stuttgart, Germany. Image by Rama, via Wikimedia Commons. There is no clear consensus over which figures taught Pericles. 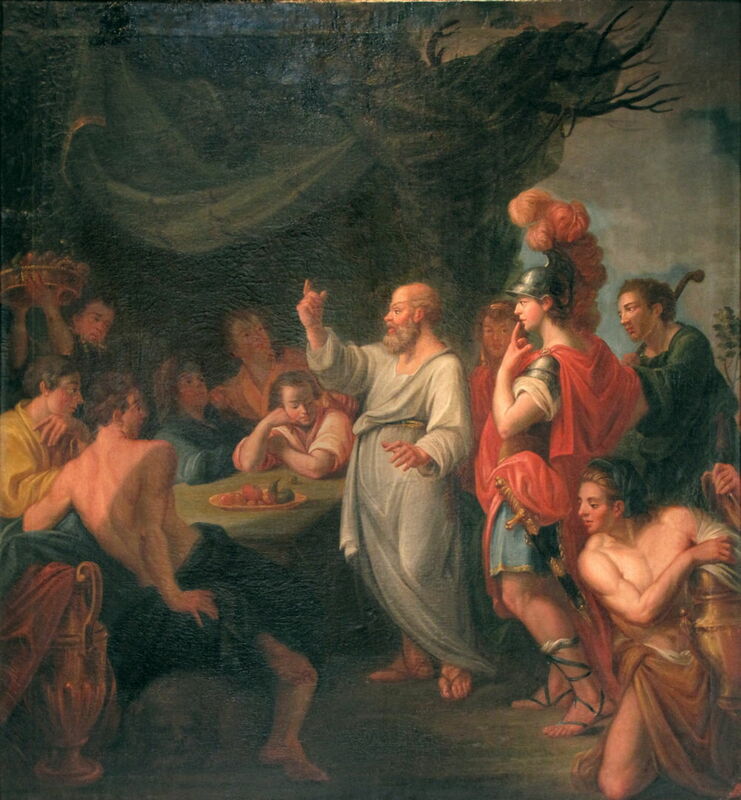 Nicolas Guibal shows Socrates teaching Pericles (1780), but Pericles was about 25 years older than the philosopher, making this unlikely. Pericles was unable to use his own wealth and property to buy his way into the hearts of the poor, in the way that Cimon had, so he tried redistributing the wealth of the people, giving generous grants for festivals, wages to jurors, and other fees. These enabled him to bring the people to challenge the power of the Council of the Areiopagus (elders), of which he wasn’t a member. Cimon had been banished for ten years following his ostracisation, but tried to return early to join the force of Athenians who were tackling a Spartan invasion of Tanagra. Pericles’ friends drove Cimon out, allowing Pericles to distinguish himself there in combat. However, the Athenians decided that they wanted Cimon back, so Pericles issued a decree ending his banishment. This allowed the two to make their peace. Pericles pursued a policy of resettling the idle from Athens, sending them to Chersonesus, Naxos, Andros, and Thrace. He also had many sacred buildings constructed, which brought employment to many craftsmen and others, and shared out the riches of Athens. Among these magnificent buildings was the Parthenon. 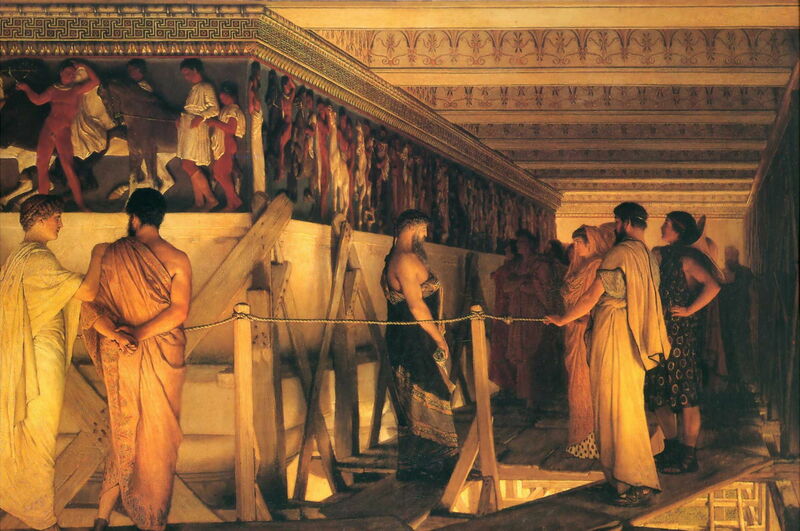 Lawrence Alma-Tadema’s beautiful painting of Phidias Showing the Frieze of the Parthenon to his Friends (1868) includes among those friends Pericles (at the right), Aspasia (see below), Alcibiades, and Socrates. Thucydides opposed this, claiming that Pericles was playing fast and loose with the public purse. Pericles put this to a public assembly, and the people at first agreed that he had spent too much. He therefore proposed spending not on their account, but on his, and having the buildings dedicated to him rather than the Athenians. At this, the people reversed their decision, wanting him to spend freely from public funds. 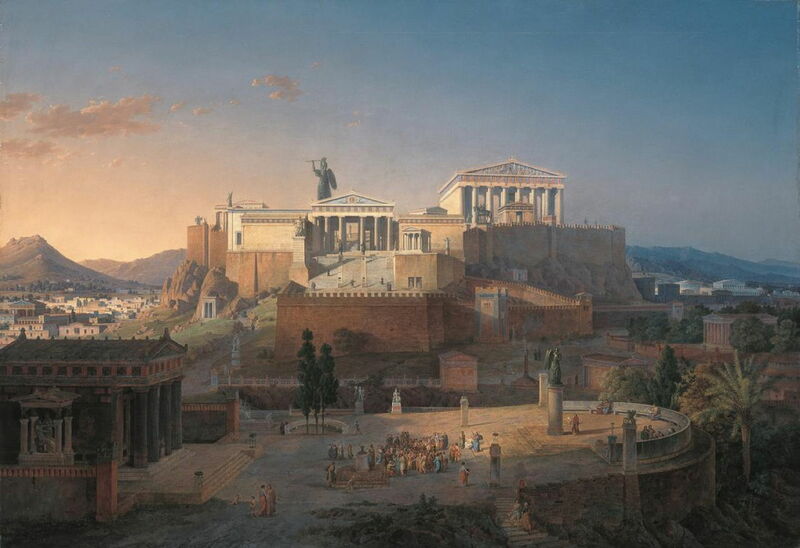 Leo von Klenze’s superb view of The Acropolis at Athens (1846) gives an idealised picture of Athens at its height. Affluent and well-educated citizens are debating the issues of the day in an open forum, with the Parthenon and Phidias’ statue of Athena on the Acropolis behind. Pericles then submitted himself against Thucydides in a vote for ostracisation, which resulted in his opponent losing and being banished for ten years. That enabled Pericles to take control of the whole Athenian state, and to act in a more kingly role. He ruled for a period of fifteen years in all, during which he stayed free of any taint of corruption. The Spartans became increasingly vexed at the rising power of Athens. Pericles then moved that all Greeks, no matter where they lived, should be invited to send representatives to a council to be held in Athens. This was opposed by the Spartans, and nothing came of it in the end. As a general, Pericles was unusual for minimising risk and trying to preserve the lives of his soldiers. When Tolmides was preparing an army to go into Boeotia, he urged him to be cautious, but the general wouldn’t listen to him and took a thousand men into battle near Coroneia. Tolmides and the majority of his army were killed there in a disastrous defeat. Instead, Pericles was remembered for his successful military expeditions to the Chersonesus, and for circumnavigating the Peloponnese with a fleet of a hundred triremes. He reversed the action of the Spartans, who restored the sanctuary at Delphi to the Delphians; Pericles reinstated the Phocians, and secured for Athens the right of consulting the oracle on behalf of others. When Athens and Sparta finally made peace, it lasted for thirty years before Pericles undertook an expedition to Samos, at the start of the Samian War. That is thought to have been to please Aspasia, a Milesian woman of great beauty and enormous influence at the time. She ran a high-class brothel at which she entertained many important Athenians, and more. Pericles had (legally) ‘transferred’ his wife to another man, then lived with Aspasia ‘and loved her exceedingly’, according to Plutarch. Artist not known, Aspasia’s Salon (1913), detail of fresco over portal of main building in University of Athens, Greece. Wikimedia Commons. 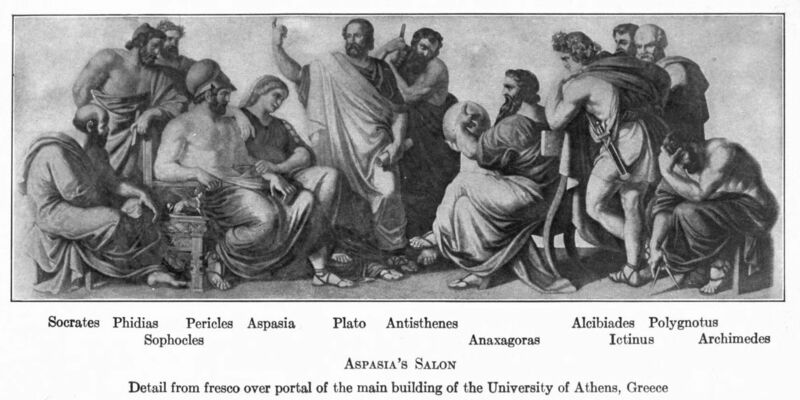 This anonymous fresco over the portal of the main building of the University of Athens shows the most prominent members of Aspasia’s Salon (1913), including Pericles, who wears a hat which makes his head look even longer. Pericles sailed to Samos with the Greek fleet, and took fifty of the foremost Samians hostage on Lemnos, set up a democratic regime on Samos, and returned to Athens. The hostages escaped back to Samos, and the Samians revolted, forcing Pericles to return and defeat the Samian navy off the island of Tragia. The Samians counter-attacked at sea and defeated the Athenians. Pericles returned, beat the Samians once again, and laid siege to their city. After eight months, the Samians finally surrendered, and their fleet was confiscated. 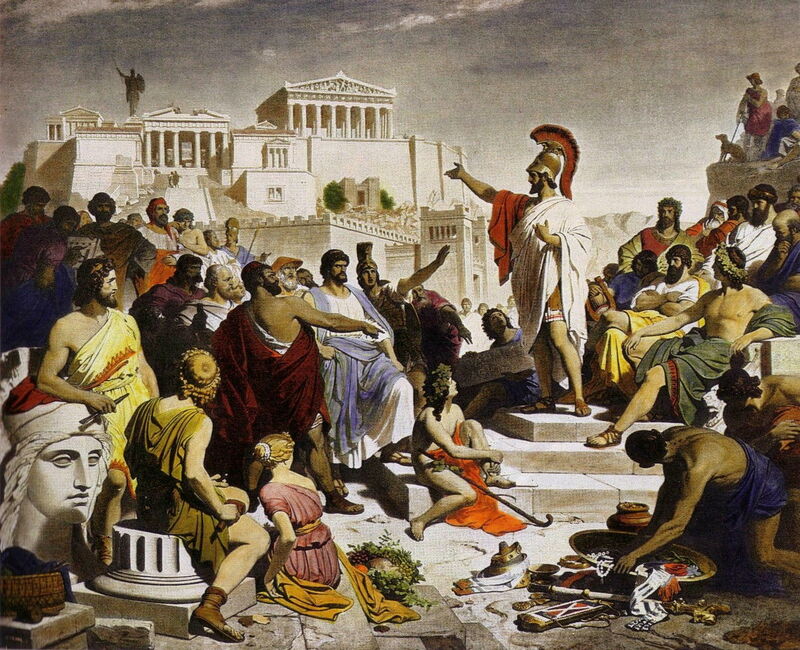 As the Peloponnesian War was brewing, Pericles acted to try to postpone the involvement of Athens, by trying to avoid committing Athenians in any precursor conflicts. This put Pericles in a very difficult position, and he also faced accusations over his conduct at home. Aspasia was charged with impiety and prostitution of free-born women to Pericles. His longstanding friend, the philosopher Anaxagoras, had to be sent away from Athens for his own protection from further accusations. Despite all this, Pericles stood his ground and retained his popularity. Jean-Charles Nicaise Perrin (1754–1831), The Friendship of Pericles for Anaxagoras (date not known), oil on canvas. dimensions and location not known. Wikimedia Commons. 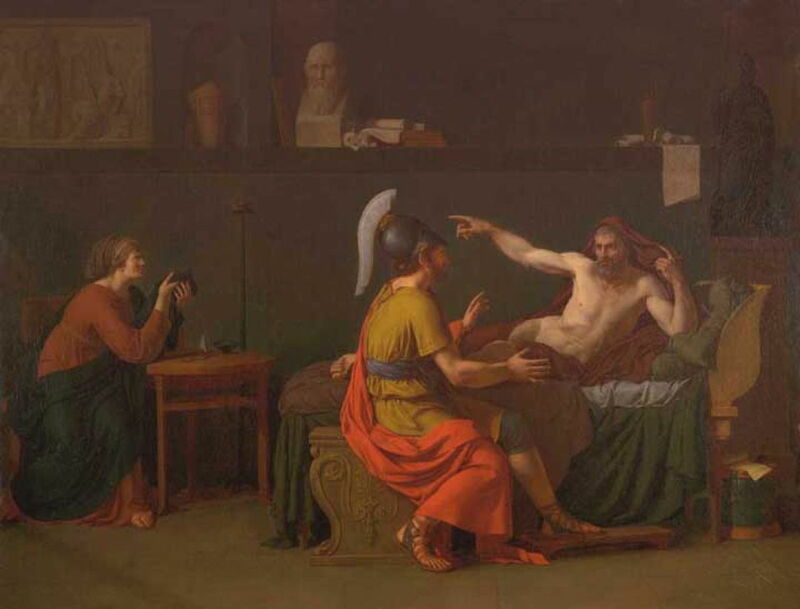 Various anecdotes of their friendship inspired Jean-Charles Nicaise Perrin to paint his undated Friendship of Pericles for Anaxagoras some time around 1800. Unusually, Pericles, the younger man, is bare headed. Augustin-Louis Belle (1757–1841), Anaxagoras and Pericles (date not known), oil on canvas, 76 x 98 cm, location not known. Wikimedia Commons. Augustin-Louis Belle’s Anaxagoras and Pericles probably dates from about the same time, and adheres to standard practice with Pericles’ hat. Sat at the left is probably Aspasia. A massive Spartan force then invaded Attica, and camped where they thought would draw the Athenians into battle. Pericles would not rise to this: he told Athenians that trees would regrow if they were cut down, but if men were destroyed it wouldn’t be easy to replace them. He shut the city up tight, putting sections under military control, and paid no attention to those calling for war with the Spartans. Pericles sent a small naval force out to the Peloponnese, but a land campaign there was less successful. 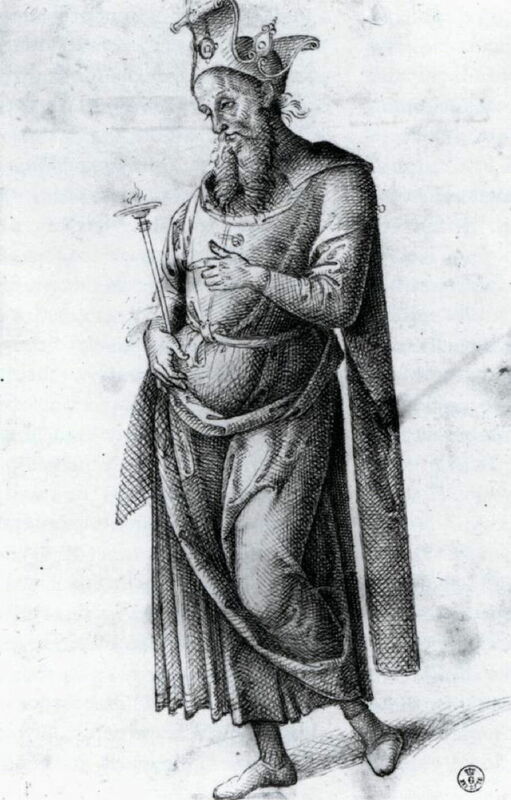 Then Athens suffered an outbreak of plague, which even killed Pericles’ own son, Xanthippus, who had taken to spreading malicious stories about his father. Michiel Sweerts (1618–1664), Plague in an Ancient City (c 1652-1654), oil on canvas, 118.7 x 170.8 cm, Los Angeles County Museum of Art, Los Angeles, CA. Wikimedia Commons. 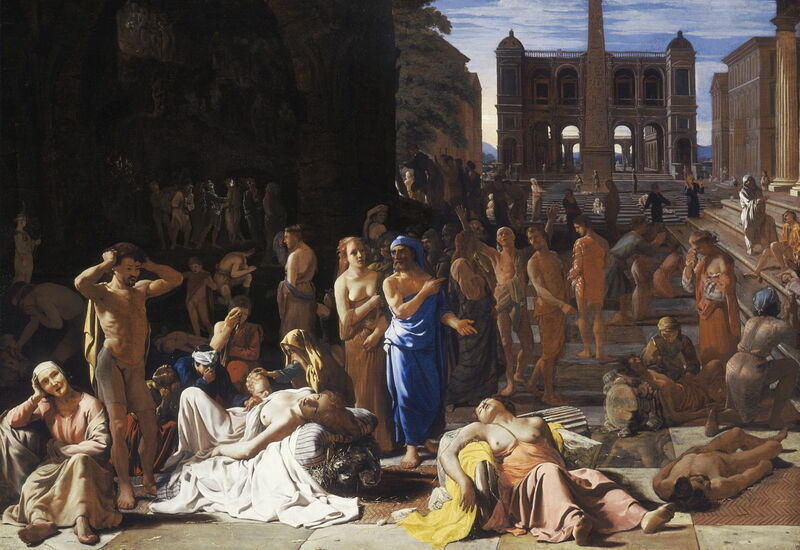 Michiel Sweerts’ painting of Plague in an Ancient City from about 1652-54 is believed to show Athens during one of these epidemics. Eventually, Pericles himself went down with the sickness. As he was dying, he asked that no living Athenian should ever put on mourning because of him. He finally died in Athens, by current consensus in 429 BCE. Alonzo Chappel (1828–1887), The Death of Pericles (c 1870), engraving after original painting, in “‘History of the World’, Evert A. Duyckinck , Johnson, Wilson & Co. Wikimedia Commons. 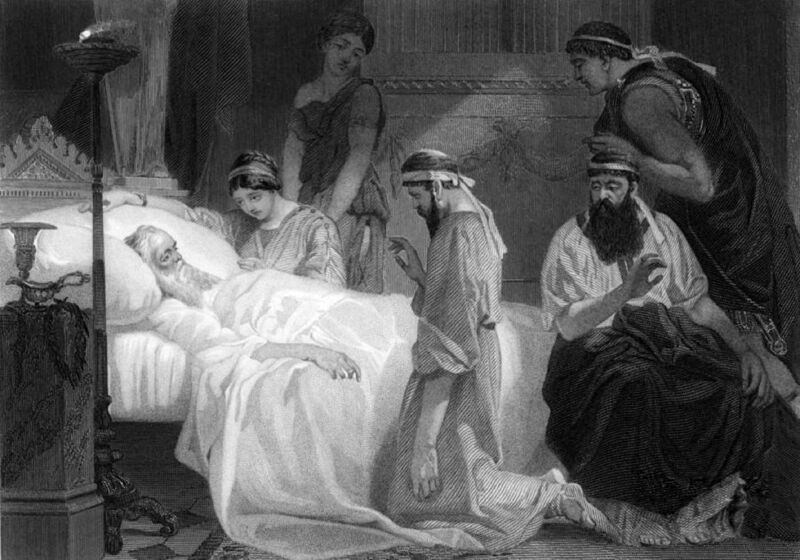 Alonzo Chappel’s painting of The Death of Pericles from about 1870 is shown here in an engraving. The woman at the bedside is probably intended to be Aspasia, although by this time she would have been rather older. Philipp Foltz (1805–1877), Pericles’ Funeral Oration (1852), engraving, further details not known. The Athenaeum. This engraving shows Philipp Foltz’s Pericles’ Funeral Oration from 1852. The speaker is pointing to his obvious physical accomplishments in the Acropolis and Parthenon. Posted in General, Life, Painting and tagged Alma-Tadema, Belle, biography, Chappel, Foltz, Guibal, history, morality, painting, Perrin, Perugino, Plutarch, Sweerts, von Klenze. Bookmark the permalink.